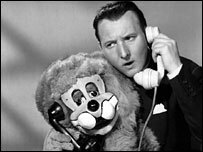 Terry Hall, who was one of the earliest children's television entertainers, along with his sidekick Lenny the Lion, has died after a long illness, aged 80. Hall, of Earlsdon, in Coventry, first appeared on the BBC with Lenny in 1956 and they had their own show from 1957. The Beatles made one of their early TV appearances in a 1963 episode of Pops and Lenny, singing Please, Please Me. Hall also appeared in the US on the Ed Sullivan Show and on UK television throughout the 1960s and 1970s.